A couple of days ago, I spotted this green caterpillar nicely camouflaged as it munched away on an arrowwood (Viburnum dentatum) leaf. 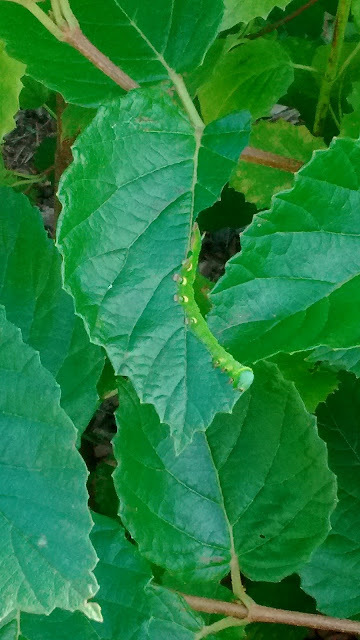 So this morning, I thought I would take another look at the shrub to see if I could spot the caterpillar again. Couldn't find it, but I did discover this little fella looking quite at home on a leafy perch! I think this might be a young eastern gray treefrog, but I'm no herpetologist!